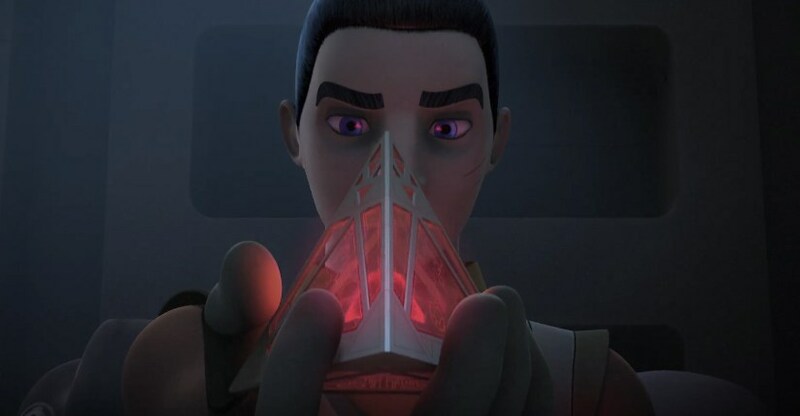 The first two seasons of Disney XD's Star Wars Rebels has done a pretty nice job of dancing around Ezra's dark side. The young padewan is on a path not too dissimilar from that of Anakin Skywalker, who we know turned out to be a pretty bad dude you might have heard of. But this season Ezra edges closer to the darkness, growing stronger the entire away. It's a strength he'll need if he's going to protect his friends from their toughest challenge yet, the newly reintroduced Grand Admiral Thrawn. In the first of two new clips, Ezra (voiced by Taylor Gray) is seen consulting a Sith holocron, which is already a REALLY BAD IDEA. But then he starts talking about how his friends wouldn't be able to survive without him, and that he'll do whatever it takes to protect them, and he sounds exactly the way Anakin did just before he became Darth Vader. Oh boy. In the second clip, Ezra, Chopper, and Hera's (Vanessa Marshall) undercover mission gets derailed when they come face-to-face with Thrawn (Lars Mikkelsen), who promptly commands she be taken away for interrogation. Have you seen Imperial interrogation methods? That won't be good at all. Thrawn was the popular antagonist from the "Heir to the Empire" novels, which saw their continuity discontinued when Disney took over the franchise. He's being brought into the canon proper now, and appears to be just as intimidating as he was in the books. I can't stress enough how perfect his voice is, too. He's not a growling soldier; he's a cold tactician who uses knowledge and logic to win. Star Wars Rebels season 3 hits Disney XD on Saturday, September 24th at 8:30pm with an hour-long premiere.